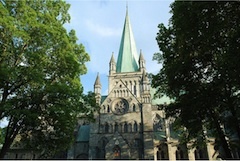 Nidaros Cathedral, Trondheim: the shrine of St Olav is a major pilgrim destination. Major meeting before St Olav's festival shows Trondheim as a model green city. Chinese Confucianists to make their first ever statement about environment. TRONDHEIM JULY 16: Next week an historical international meeting in Trondheim will help dozens of important pilgrim shrines and places including major cities, important tiger reserves, and great holy rivers become more environmental, and inspire many others to make positive ecological changes. Trondheim has already shown itself to be a model of ecological planning and action, and by hosting the second inaugural meeting of the Green Pilgrimage Network (GPN) it is consolidating its position as a leading promoter of environmental action. 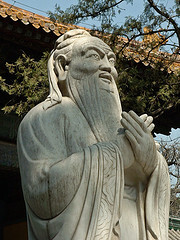 Statue of Confucius from the Temple of Confucius, Beijing. PHOTO: Creative Commons, Ulrichsson. Trondheim to host some 90 religious and secular leaders from China, Japan, India, Palestine, Israel, Mexico, Nigeria, Armenia and many European pilgrim places including Vadstena Sweden, St Albans, Norwich, Iona, Luss and Canterbury in the UK, Santiago de Compostela in Spain etc. An historic announcement by the Confucian tradition in China on the environment. Secular and religious decision-makers to compare examples of best practice, and be helped to leverage their position as holy places to get more funding and energy put towards improving the environment and helping their millions of pilgrims be positive rather than negative impacts on the earth. The conference is co-hosted by Trondheim Nidaros Diocese, Trondheim Municipality, the National Pilgrim Centre and the UK Based international Alliance of Religions and Conservation (ARC) which started this process in 2009. Amritsar, holy city of the Sikhs, relaunching its founders day in July as an annual chance to clean up the city, plant thousands of trees including lining the main, busy, dirty GT road with saplings, and raise awareness among the community. Scottish pilgrimage sites and paths joining together with local government to get environmental funding because of the pilgrims who pass. Worldwide it is estimated that at least 200 million pilgrimages take place each year. Though 2013 is a special year with an extra 100 million pilgrims attending the 12-yearly Kumbh Mela in India in January and February. The potential of environmental work within this area is thus enormous and UNDP has described this kind of movement as potentially the world's largest civil society movement on climate change. 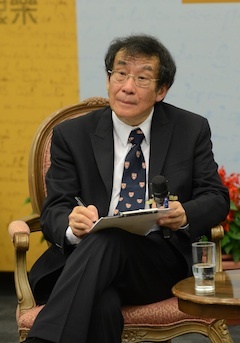 Several representatives from the Chinese Confucian tradition are among the guests, including Professor Tu Wei Ming, President of the International Confucian Ecological Alliance (ICEA) and Director of the Institute for Advanced Humanistic Studies at Peking University. They will be announcing their first ever ecological statement at Trondheim. The 500 Confucian temples in China, through their formal organisation will over the next year discuss how to be green pilgrimage sites through looking at their food sourcing, green power, transport, rubbish collection, etc. This is the first time that the Confucianist tradition of China has spoken out on a pressing social issue since the end of the twelfth century, said ARC's Secretary General, Martin Palmer. At a time when relationships between China and various Western countries are strained at a political level the visit of leading Chinese Confucianists accompanied by delegates from the wider Daoist community is of immense significance. It shows that perhaps it is culture and faith and philosophy that can build bridges more effectively than politics and economics, he said. PHOTO OPPORTUNITY: There will be an opening celebration including a robed walking procession to Nidaros Cathedral from the Rica Nidelven from 17.45 on Friday July 26. Full timetable of Trondheim event. Report on the outcome of the Trondheim Green Pilgrimage Network meeting here.